Stylish & original Keith Brymer Jones crafted espresso cup with “café” hand stamped by the skilled hand of a master craftsman into the super white porcelain body. It’s elegant & cool style are what we’ve come to expect from the master ceramcist, Keith Brymer Jones. The classic white espresso cup with the word “café” hand stamped & painted in red into the porcelain body. Keith Brymer Jones’ word range features other espresso cups to go alongside this one like ‘hot’, ‘Love’ or ‘espresso’. These designer espresso cups are made from super white porcelain with the words embossed & painted by hand in Keith’s distinctive retro typewriter font. Dishwasher safe & microwave safe, the white porcelain espresso cups in Keith’s Word Range are available with a variety of different words on them so you’re bound to find something that suits your individual style. 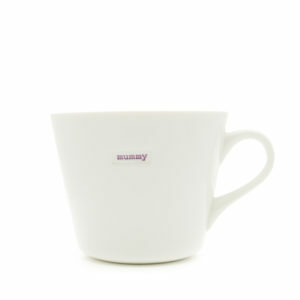 Some demitasse’ in the Word Range are also available as pairs & sets of four to make a stylish & unusual gift. Keith’s Word Range demitasse cups (the French word for espresso cups) were selected by the Evening Standard for their 10 of the best espresso cups alongside other notorious home-ware designers including Le Creuset, Wedgewood & Tom Dixon during the London Coffee Festival.